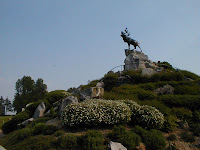 To commemorate the Battle of Beaumont Hamel, the annual Run For Freedom is set for Saturday June 30. The 8K road race and 5K fun run/walk both start 10 am at the Legion in Riverhead St. Mary's Bay. $10 registration, medal for all participants, and reception to follow. Contact kevinfagan@nl.rogers.com (368.0565) for more info.